Hi everyone, I'm participating in a blog hop today with Imagine Crafts and Crackerbox/SoSuzy stamps and I've got 2 cards to share. 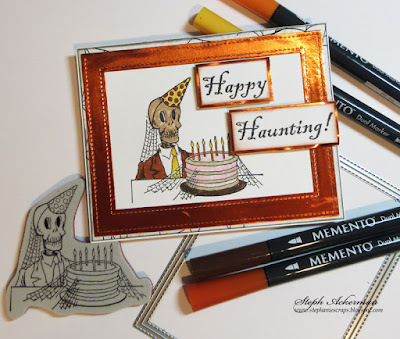 My Happy Haunting card uses the Birthday Skeleton. He was stamped with VersaFine Ink in Onyx Black, then I used Memento Markers to add color. For the frame, I used Rinea Marigold/Gold Glossy Foiled Paper, then I die cut it with Lawn Fawn dies for the perfect frame. 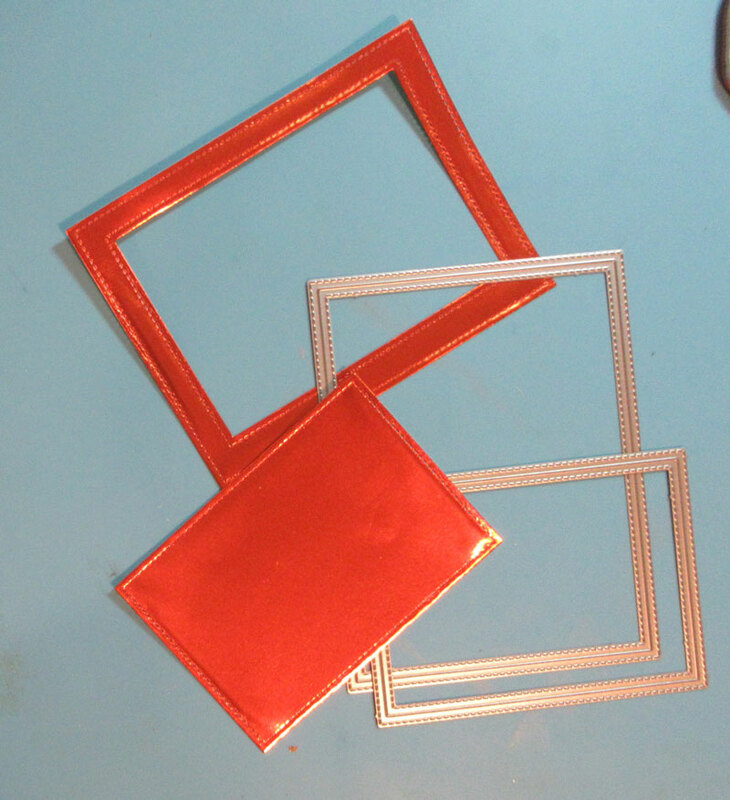 Creating a horizontal card, I framed my image with the foiled frame. By adding Happy Haunting, he becomes a perfect Halloween card, don't you think? My next card uses the Halloween Tree and the awesome VersaFine Clair Inks. 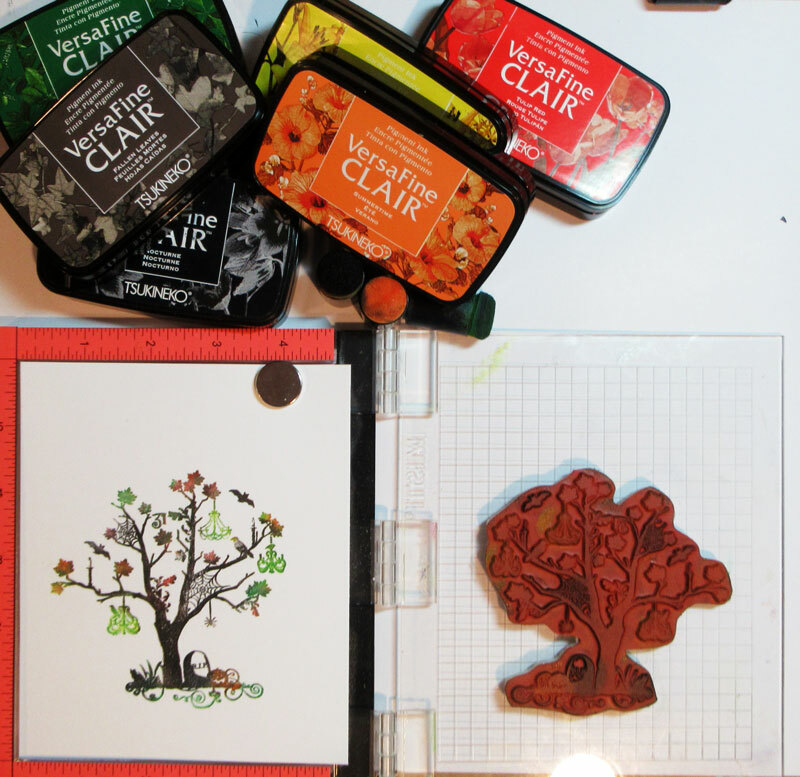 Placing the stamp on my Misti, I first inked the tree with Fallen Leaves. Using a dauber, I added additional colors to the stamp using Nocturne, Cheerful, Summertime, Tulip Red, and Green Oasis inks. The card was created from orange cardstock. A tartan panel was matted with green cardstock and strips of orange and green added across the center. Twine was wrapped around the panel and it was then added to the card. The tree was die cut and matted with a larger die and added to the card with foam adhesives. Happy Haunting was stamped in Nocturne Ink and then cut apart. 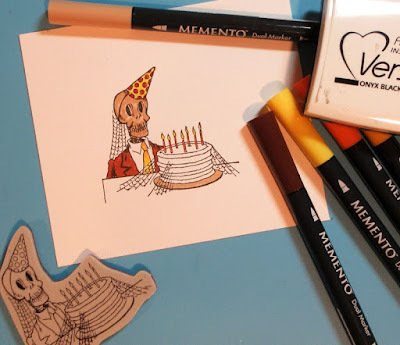 It was then matted with orange and green cardstock then added to the card. You can find yesterday's links by starting at Imagine's blog. Thanks so much for stopping by. Be sure to leave comments on each blog during the hop so you can be entered to win a $25 Crackerbox + Suzy Stamps Gift Certificate or one $25 Gift Certificate from Imagine!!! 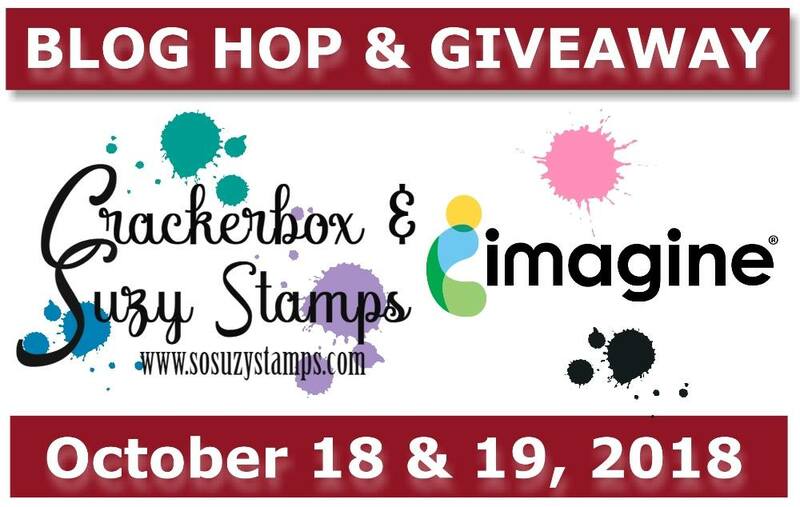 Winners will be announced on the Crackerbox + Suzy Stamps and Imagine Blogs on October 26, 2018. 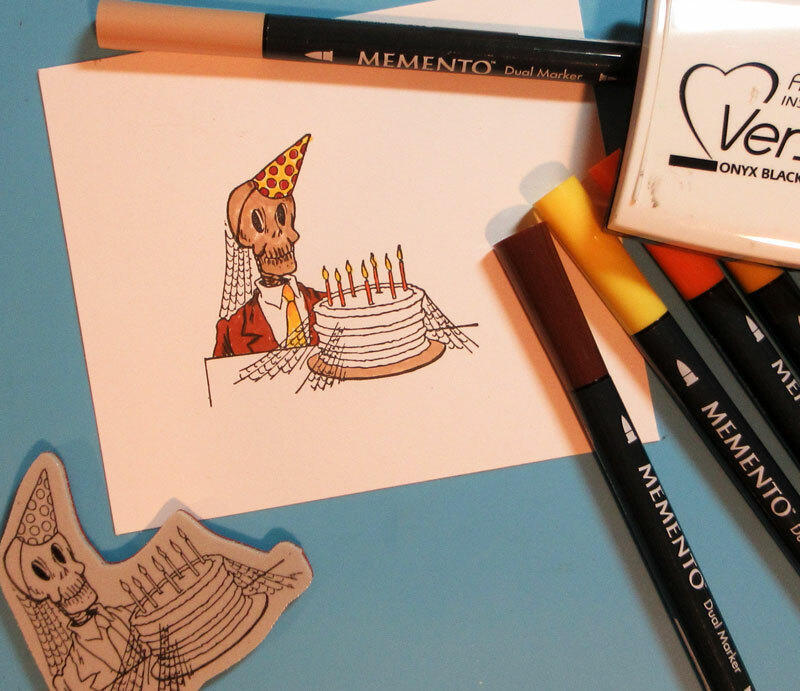 Like the little birthday skeleton guy, he's looking pretty dapper. Nice cards. Such great cards! Love the skeleton so fun! 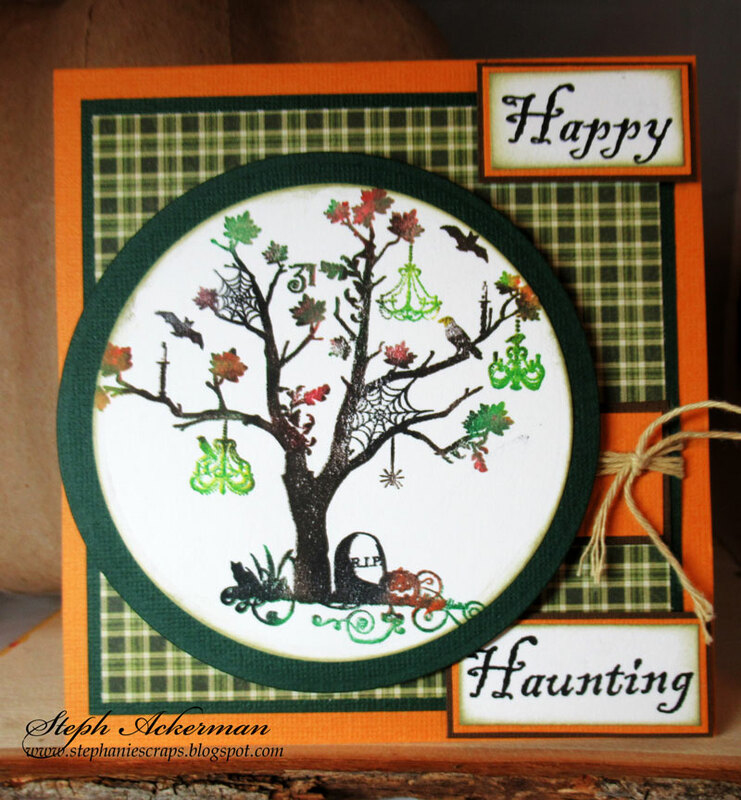 I love that Halloween tree and what a handsome gentleman in your first card. I love the foil you used. What fun cards for Halloween. Love the foil frame. Both cards are wonderful! I love how you used the same sentiment on two totally different cards. Thanks for the inspiration. Beautiful palettes on these lovely cards. The foiling adds the perfect touch for autumn. Thanks for sharing your creativity. Very imaginative cards! Very cool and colorful looking too! 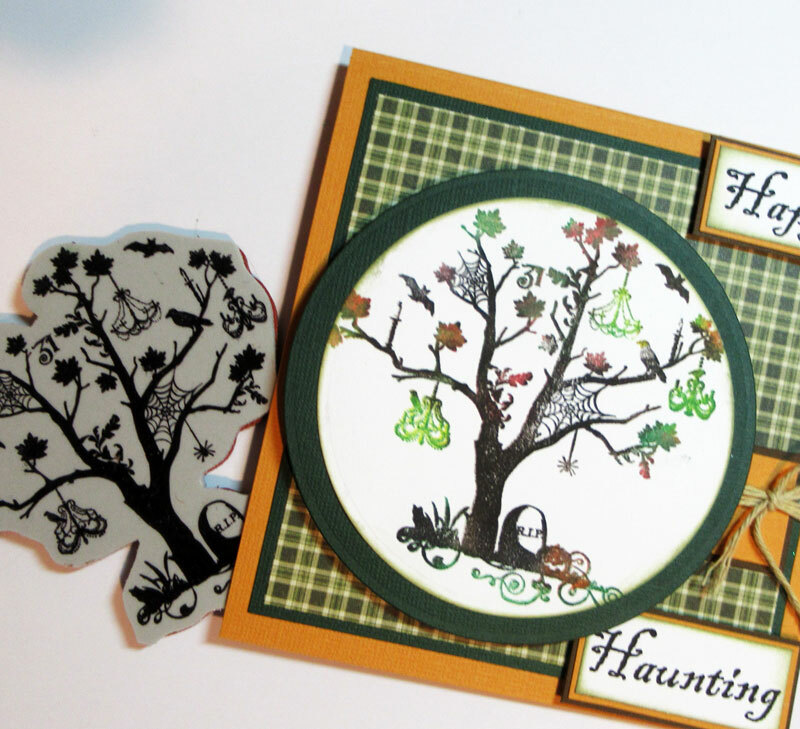 Fantastic Halloween cards! I love the stamp on the first card! Such fun cards! Love the stamps you used! Happy Haunting is awesome, and Halloween Tree is one of my favorites! Can't wait to try the VersaFine Clair inks!